Now you're talkin' Doc. $20 sounds just right. Trouble is the young blokes at work who understand EFI tell me that if I use a tank from a carby car I'll have to use a swirl pot as well. Not that that's a problem, it's just more stuff to do (and buy) and if this thing now has to be done by October I'm in big trouble already! Seriously though I understand what you mean, that 4 month cushion would mean plenty of testing time and problem solving done before it matters. We aren't short of test venues here, we have Willowbank drag strip, Queensland Raceway, Mt Cotton Hillclimb and in Warwick there is the excellent Morgan Park Raceway. Once the car is back on its new wheels with the engine mounted and has driveshafts I'll be well into the build stage rather than just messing around with an empty shell. After that the roll cage goes in, I'll get the engine running and the rest should take me through to Christmas. And I still have to build the trailer. Could you can open it all the way 'round then slide one half inside the other? Same mounts and filler but less volume... and cheap! Rob, I had a long look at the tank last night. Unfortunately it isn't a regular shape. It is very wide with odd shaped bits on the ends. It is held in with two longitudinal straps about a quarter of the way in from each side. I might be able to chop off both ends and narrow it down to just wider than the straps then extend the filler tube to reach the new side wall. That would halve the capacity and give me a chance to foam fill and baffle it. It is also very flat so I might not touch it until I have designed the belly pan. With just a quick look I might have to cut out the spare tyre well to slick up the underneath which would then mean the tank was too low at the back. I suppose I could always just fabricate a small rectangular prism that hung from the strap mounting points. Does anyone know how big I should make it? Thanks Doc, but for the moment I think I'll leave the fuel tank and concentrate on the suspension and brakes. I haven't forgotten your idea of actually having a plan rather than stumbling along trying to do a bit of everything all at once. If I didn't have ADD I'd probably be able to manage it. With luck I should have the Camry stuff bolted into the Celica by this time next week. At this stage it looks like I might have to tub the engine bay wheel arches at least and then chop a lot of sheet metal out as well. At least the engine will fit properly then. If I have to tub the rear wheels as well to get my desired ride height so be it. I don't feel like compromising the end result just for an easier build. I found a bloke on e-bay in SYD who does the perfect wheel tub for the job. My brother was up from SYD so we got stuck into the Camry and finished removing all the bits we need and then some. There's enough stuff over to start a hot rod but that's for another time and a better donor car. I have removed all the Celica suspension and already we are starting to find common parts. The 5 stud hubs bolt straight onto the Celica uprights and use the same holes for the backing plates for the drum brakes and the plate that holds the caliper. All we had to do to make them fit was cut the ABS wheel off the back of the hub. It looks as though the track width won't change either. The Camry discs have a complete drum brake setup inside them for the handbrake but I won't use them because a handbrake isn't necessary and just adds more unsprung weight. The only things that don't line up are the holes in the uprights for the strut legs but that isn't insurmountable. Besides, it might be easier to find performance struts for a hairdressers car than a grandmas car! So Dave.. Hows the Silly-car going? Rob, last weekend I was busy with other stuff but I still managed to get the rear caliper brackets cut off the Camry backing plates. That was a lot of figuring out as I went but I finally did it. The second one came easier because I was suddenly an expert. The handbrake shoe pivots were hot formed rivetted into the three piece backing plate and I wore out a cutoff wheel and a 1/4" drill destroying the 6 of them. This weekend I will sandblast all the parts at a mate's place and start the reassembly of the rear suspension. I expect to have both rear uprights back on with the brake calipers temporarily attached by Sunday night. Then I'll know (or be closer to knowing) if I have to tub the rear wheel arches. I suspect I probably will. One of the many things I find disconcerting about working on an old road car is that everything has years of road dirt on it and when I clean one part it just makes everything else look even worse. I'm used to karts and Vees and such that can easily be kept sparkling clean. I also got the Camry shell towed away so now there is much more room under the 24' x 16' tarp in the backyard that is my workshop. I am also distracted at times by that Yamaha powered street luge. I already have the same engine with clutch and pipe and kart wheels needed to build a motorcycle streamliner very similar to that, but they're all 20 years old and wouldn't be worth the effort. Besides that, who wants to only go 105 mph? Are you any closer to finalising a design for your tank? David Leikvold wrote: Are you any closer to finalising a design for your tank? As the Cranberries sang "In my head, in my head". I tend to over research but learn a lot in the process. If I run the tank pointy end first I can lay on my back, I wonder what that does for drag?? the 924/928 Porch did ok from memory (drag wise). Oh for some fluid dynamics software. Sounds like you need to just pressure wash the bejesus out of the underside before you get too excited and make it heavy? A couple of 2X4 underneath and a 4WD high lift jack would do the trick, that or a BBQ where you get a few suckers err mates to help..
At least you're making material progress! Maybe a gas axe for any future rivets too if you're chewing wheels with gay abandon.. Yes, you're right of course. A good belt with the Karcher and a scrubbing brush would do the job nicely and the ground would dry out again by the next weekend so this Sunday afternoon I'll do that. I'll put a tarp under the car as well to keep the run-off running off. Oh, for a two post hoist! OK, now it's time to discuss your tank. How big is the tank itself? How long is it, how wide is it at its widest point and how far along is that point? If it's so small that it has to be backwards for you to fit in it I'd say it might not matter much aerodynamically (don't quote me) but if it is going to be a motorcycle streamliner you might find it wants to swap ends at speed when the aerodynamic pressure exceeds the traction, particularly if you suddenly got some high speed wheelspin on a soft patch. Plus you'd never hear the end of it from most observers! If you decided to build a lakester with it instead you would get a lot of bulky componentry out of the tank space and have much more resistance to spinning out. 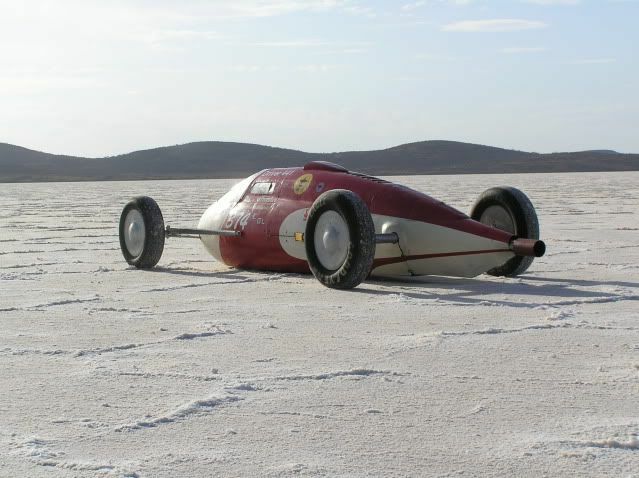 And as I once suggested to Dr Goggles, if you put full wheel covers on it you could run as a streamliner too. Any favourites in the engine choice yet? And just for the Queenslanders, Hare & Forbes at Coopers Plains is having a sale now until Saturday. No, they aren't paying me for this. I don't want to hijack/pollute yours. I doubt you'll regret the time spent cleaning up before continueing and you'll probably spend a lot less overall than "spot" cleaning as you go. You'll have to run the Gerni/K'archer out of a bucket remember! and you'll have to fill that bucket and all the others you'll need from your 4 minute showers!! Maybe you could angle the tarp into the bucket and wait for the predicted rain next week..... damn water restrictions!!!!!!!!!! I remember speaking with a mate from melbourne a year or so back, they weren't allowed to use a garden hose but could pressure wash to their hearts content.. go figure that one.. It's OK, I've got a full 3,200 litre rainwater tank uphill from the car so I'll just connect the Karcher to that via the hose. I think that's legal. The wife rang and needed my kiddy minding services and I couldn't get over to check out the sled. I reckon after today's tether car experience you should be able to get 1000hp out of the go kart motor, put in a 1.5:1 diff and you should be doing 300mph in the sillycar.